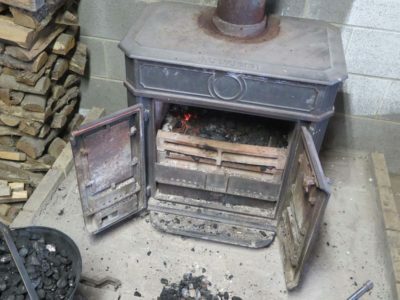 My morning routine over the winter involves a light bit of attention to the wood/coal stove one morning and a more in-depth regimen the second day. Here is how my day usually begins for the heavy heating season from about the beginning of December through mid-March. I guess I could just rely on the propane wall furnace, but since propane is the very highest expense method I am disinclined to go that route. 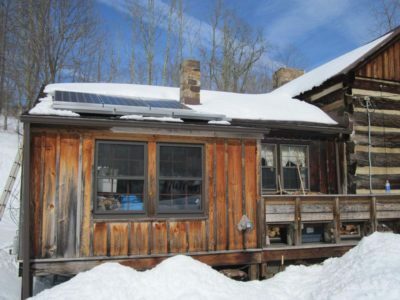 I’m guessing that would be somewhere north of $750/month even though my workshop is super-insulated (R43 XPS panels). I longingly note the falling prices of gasoline and the simultaneous rise of propane prices, the last fill-up was almost $4/gallon. So instead I rely on my triple combination of wood, coal, and kerosene. 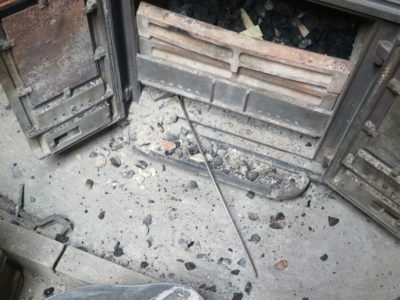 On half of the mornings I arrive to a half-clean firebox with a few glowing coals, keeping the space between 45-40 degrees requiring only a couple minutes of cleaning out some of the clinkers. All I have to do is fire it up again and it is ready to work all day and through the night. 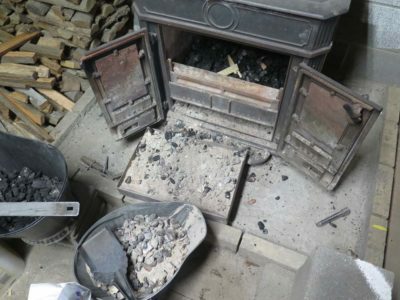 On that second day, however, the residual pile of clinkers requires a pretty thorough cleaning of the firebox. 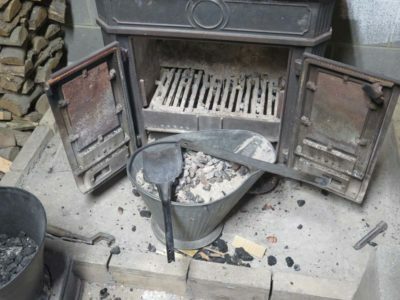 I must say I am pretty disappointed at the mound of clinkers remaining after the fire, I’ve been buying what I thought was good quality anthracite but as you will see there is always a full bucket of clinkers to get rid of. 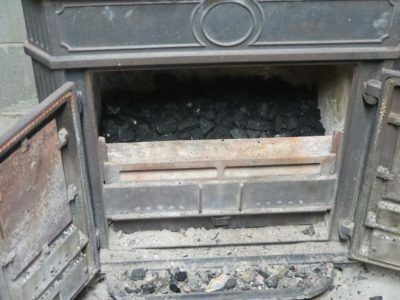 If I had cleaner burning coal my clean out would take two minutes a day. 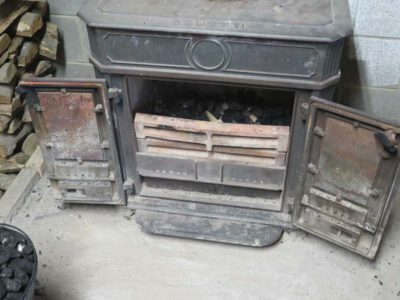 This is what the fire box looks like after two days of burning. The clinkers fill the bottom from the bottom horizontal grate, slightly below the bottom of the opening, up to the top of the removable fence grates in the front. It is now time to lay the foundation for the new fire to come. I put the bottom fence grate in place and fill the space behind it with coal to a depth of 2-3 inches. It is now time to turn my attention to the ash box, which slides out like a drawer. Its contents join the clinkers in the ash bucket. 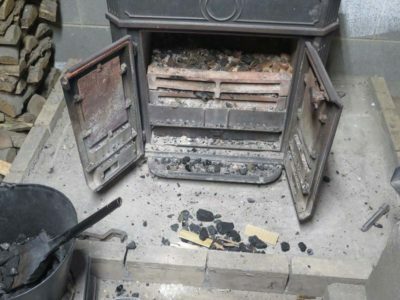 Unfortunately the ash box goes into a space that is larger than it is, so the areas outside the ash box need to be cleaned out too. Once everything is cleaned out and swept the whole assembly goes back together. On top of the bed of coal I place a paper towel left over from its use as a wax filter, then pile kindling on top of that. 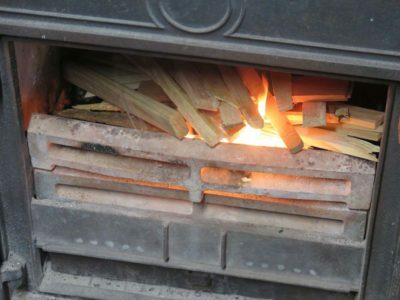 I leave a little tail of the firestarter poling through the front fence to give me an easy place to light the fire. Which I do. Before long I have crackling flames. This usually takes a minute or so. After about three minutes I set the stove doors for maximum bast furnace effect. About 5-7 minutes later the chimney is hot as a pistol. This is not the heat level I maintain, I normally operate the stove near the bottom of the operating range. 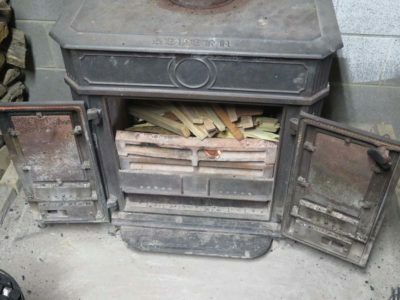 I can now leave the stove on its own for an hour or so, then add another piece or two of firewood and another couple scoops of coal. 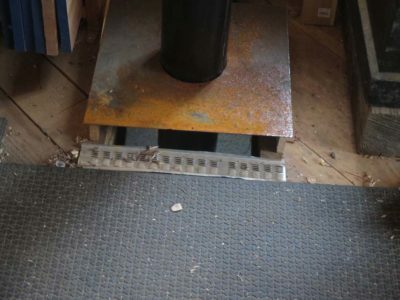 Meanwhile, upstairs at the floor level of the shop, I have created a heat stack vent by raising the chimney collar. 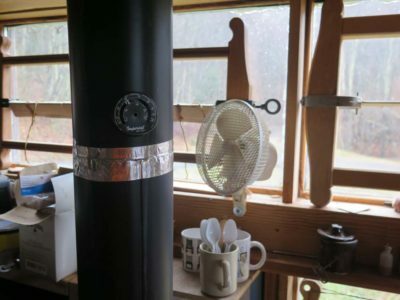 This allows the hot air from both the stove and the chimney to more easily enter the shop. Usually about the time I get back upstairs the stack is providing hot air for the space. 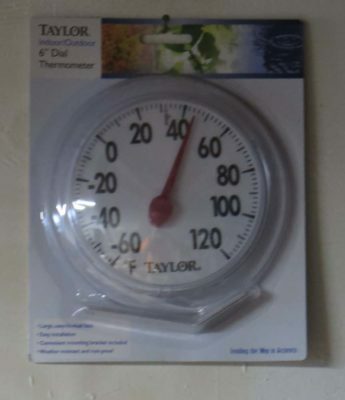 I augment this with a small fan blowing on the chimney to distribute even more heat into the space. 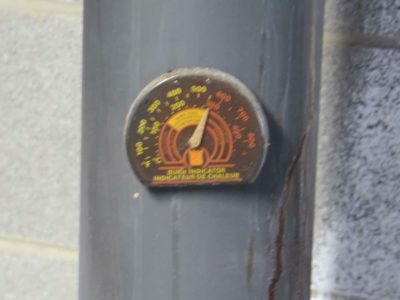 I used to have a heat exchanger in-line in the chimney but have it currently removed because it requires constant power and in the winter I often power down my entire system at the end of the day. I add additional scoops of coal a couple times throughout the day, but mostly I just get on with my day, loading it one final time when I close up for the evening. I cannot pretend I am completely satisfied with this system. 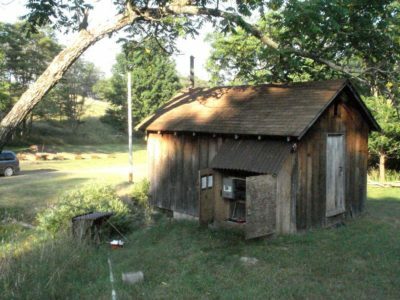 We are looking into upgrading the heat source for the cabin, and I just might do so for the barn too. 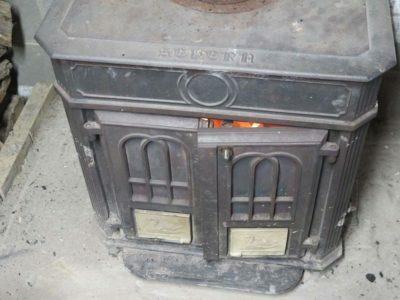 I’m thinking about a Kimberly gasifier stove but am still gathering information. 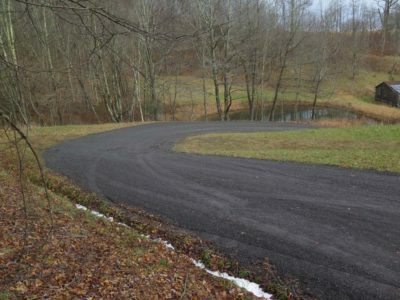 Recently we “got around” to a project more than a decade in the making, namely the rebuilding of the driveway at the homestead. 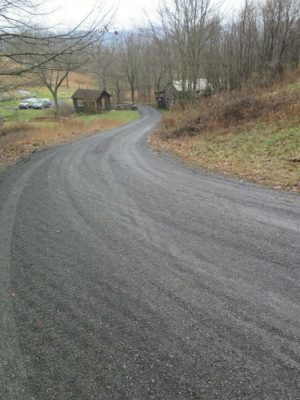 The issue came to a head a while ago when the UPS truck struggled getting up the straight but fairly steep and narrow driveway to the barn. The existing driveway there was a “temporary” path laid down for the initial barn raising eleven years ago, so the time was at hand. 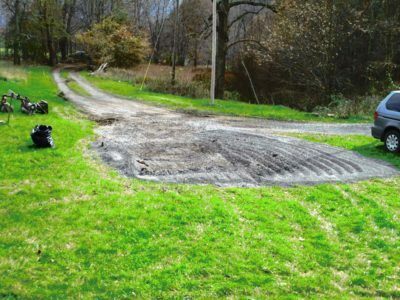 Between the hurdles of weather and resources we sorta scheduled the work late last winter and we finally got a stretch of days dry enough for the ground to firm adequately for the heavy equipment. I believe the curb weight for a loaded dump trunk is in the neighborhood of 50,000 pounds. 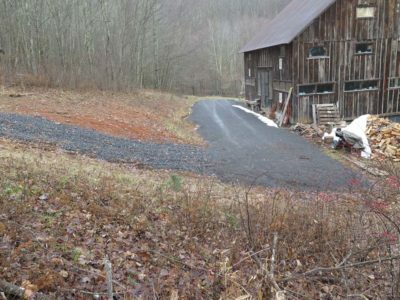 As I understand it the process of building or rebuilding a driveway is dependent on the ability to first lay a deep foundation of cash on the ground. 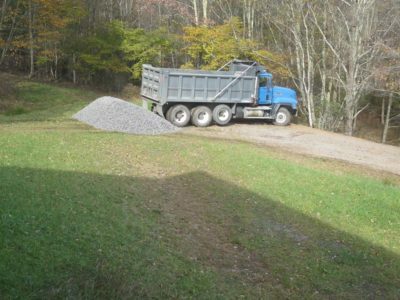 Actually it begins with scraping the bed flat and smooth, then building the roadway with first coarse gravel followed by fine gravel. It packs like concrete. This is then smoothed and packed, and if done well will last for decades. That’s what I’m counting on. The new driveway crown is a foot higher than previously in some places. 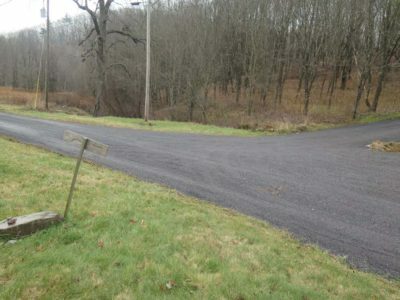 Make no mistake about it, this makes coming and going to and from the barn a whole lot easier. 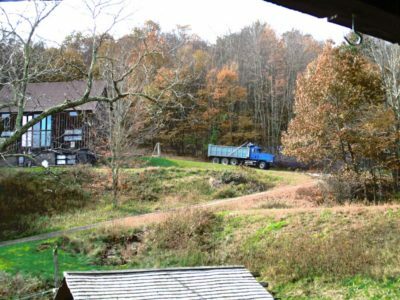 Now I will no longer have the UPS/FedEx packages dropped off on the cabin front porch when they are meant for the barn. 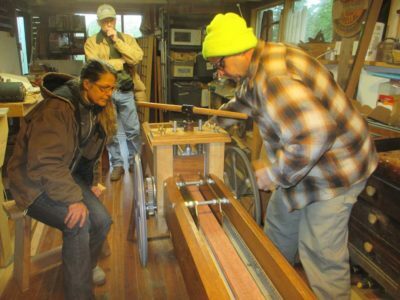 I have settled on the topics and approximate schedule for next summer’s classes here in the hinterlands, with three of the four classes emphasizing toolmaking. I will post about them in greater detail in the near future. One minor change I’ll be instituting next year is that three-day workshops will now be Thursday-Friday-Saturday rather than Friday-Saturday-Sunday as before. 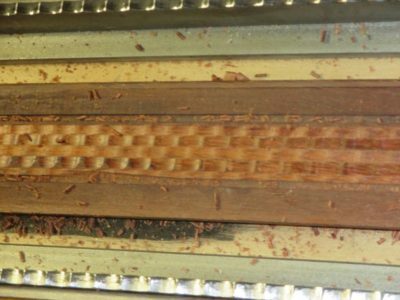 June’s class will be a metalworking event, Making A Nested Set of Roubo’s Squares. 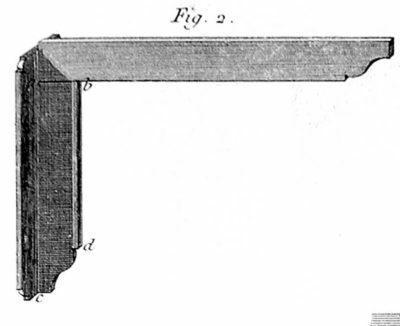 The objective will be for each attendee to create a set of four or five solid brass footed squares, the sort illustrated in Roubo’s Plate 308, Figure 2. 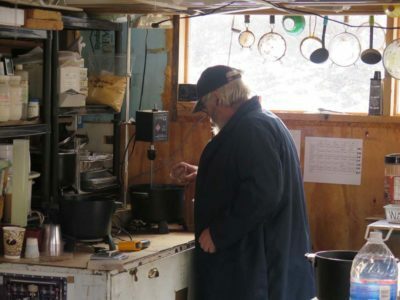 The special emphasis will be on silver soldering, a transforming skill for the toolmaker’s shop. The tentative dates for this are June 6-8 or 20-22, $375 + $25 for materials. 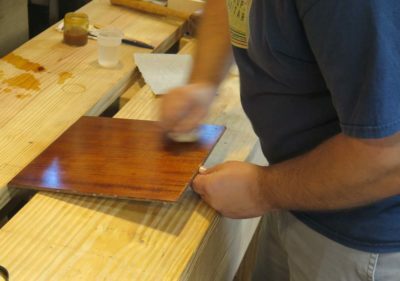 July’s class will be my annual offering of Historic Wood Finishing. Each participant will complete a series of exercises I have devised for the most efficient learning experience to overcome finishing fears and difficulties. 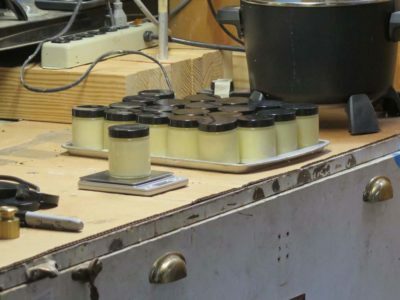 Of particular importance are the aspects of surface preparation and the use and application of wax and spirit varnish finishes using the techniques of the 1700s. Probably July 11-13, $375. In August we will continue the pursuit of Roubo’s tool kit, this time Making and Using Roubo’s Shoulder Knife. 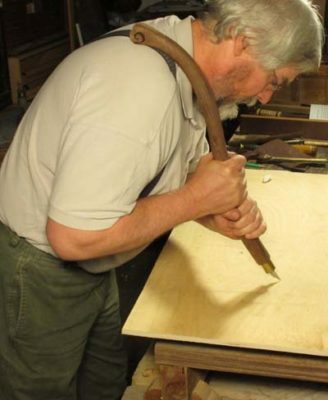 I have no way to know exactly how prevalent was this tool’s use in ancient days, but I suspect more than I can imagine. Each participant will fabricate a shoulder knife to fit their own torso, so its use can be both the most comfortable and the most effective. Probably August 15-17, $375. 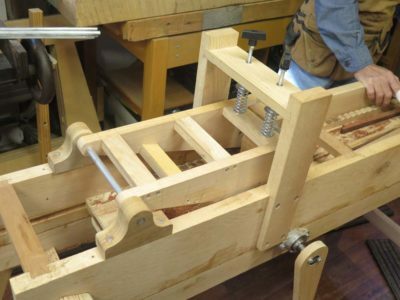 The final class for the year will be a week-long Build A Ripple Molding Cutter. As I have been pursuing this topic and blogging about it, fellow ripple-ista John Hurn and I have settled on a compact design we think can be built by every attendee in a five-day session. 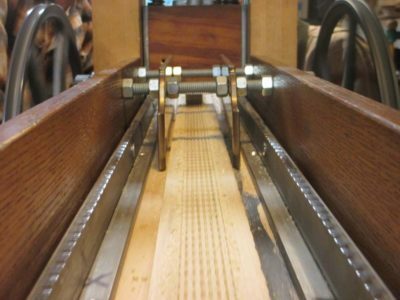 Together we will be teaching the process of ripple moldings and fabricating the machines that make them. September 23-27, $750 plus $200 materials fee. Save the dates and drop me a line for more information. Something wondrous this way comes. 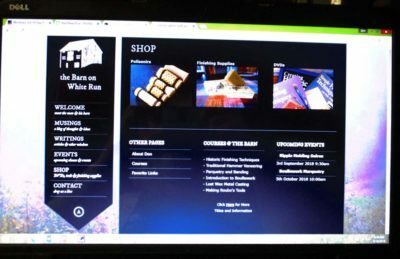 Thanks to months and years of work on the web site new things are beginning to appear, with even more to come. Other things which do not show are also manifest, including moving the entire website to both a new server and a new software platform. This require Webmeister Tim to migrate almost 4GB worth of files then checking each one to make sure it did its part. 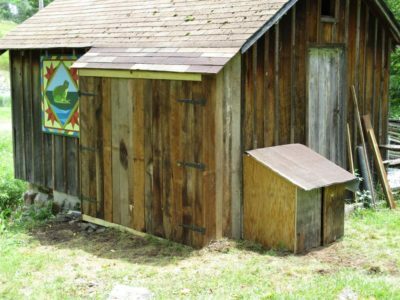 The Don’s Barn Store is now up and running! Well, we think it is running but have not yet had any new orders so I cannot promise that for sure. But the Store Page is up. 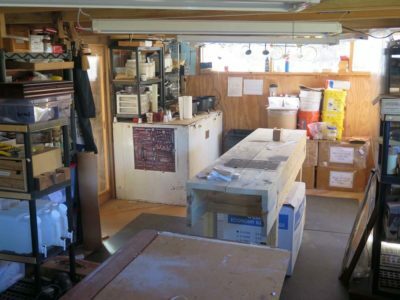 For now it has a few of my finishing and video products but will expand to include rare First Edition Roubo prints, registration for classes at The Barn, links to my books, and new finishing products as they come on line. 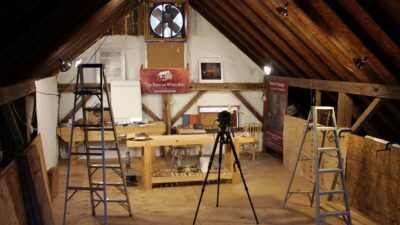 I have begun inputting information and maintaining the calendar of Barn Classes, my presentations, and other events that might be of interest to you. It will become my routine and habit to keep this as up-to-date as I can. This stuff is still not natural to me so please bear with me as I ease into the 20th Century. The Comments function has been up for several weeks now, and is thriving(?). About 99% of the Comments are spam that the filter catches. I had no idea there were so many folks thinking I was interested in fake Air Jordans, Russian girlfriends, and support for updating site content with vague and breathless praise for the site while offering new content for only a dollar an article! Call me skeptical if not downright suspicious. The immediate future holds the revival of the Shellac Archive (I have already scanned thousands of pages with many more thousands to go), uploading of all my articles from the past few years (at least the two dozen or so I can find), and the initial postings of our nascent video enterprise. I’m even thinking about vlogging once I can figure out how to capture and edit video snippets from the workshop. Maybe if I get far enough along with my furniture conservation thriller novel I can start serializing that as well. 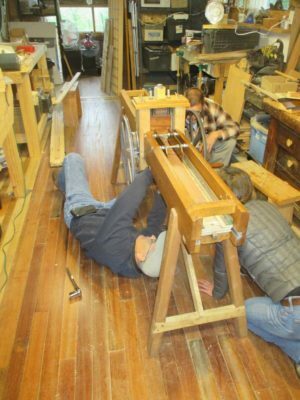 And the blog will be featuring new arcs as metalworking, toolmaking, and furniture making grow in prominence at The Barn, and the foundry and machine shop all come more on-line. The visitorship stays stubbornly loyal at an average of about 375 hearty souls a day (I check my stats on occasion without actually understanding them well, and my traffic this year is identical to that of my first year of 2014 so at least it is not declining). Thank you all for following the adventure on the homestead. With all the disruption of two robust independent electricity producing systems going belly-up at the same time I decided to add another producer into the mix, is essence to modify the “two is one and one is none” rubric for logistical planners into “three is two, two is one, and one is none.” In the absence of the hydro and solar electron hamsters I relied on my gas powered generators and a bunch of extension cords. 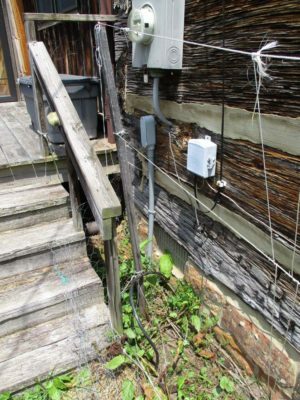 I decided to contact the local electrician to see if he could wire the generator into the service panel of the barn, and he suggested instead wiring it into the power system at the bottom of the hill, alongside the electrons provided by the hydro and solar units. I got a quote, smacked my forehead and said, “Of course!”, and authorized the work. 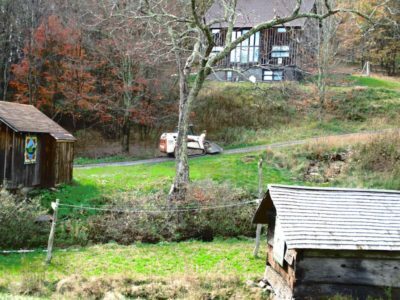 Plus, since there was already a buried cable from the powerhouse to the cabin, could he perhaps also wire that into the system? Sure, he sez. The day came when he and his son, also an electrician, arrived to do the work. The first step was to clear the work area, which translates into “ripping off the raggedy shelter over the electronics closet.” I’d been wanting to do this anyhow in order to build a more proper enclosure for all these components so this was the time. 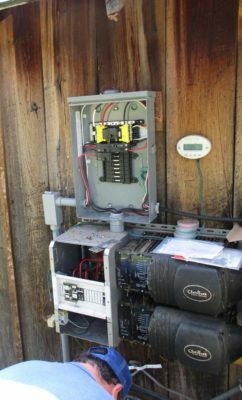 In no time flat they were abuzz with work, installing a new sub-service panel to provide for vastly improved current distribution. After a bit of time they separated so one was completing the sub-service box to serve as a new router for the electricity and the other was making the modifications to the service panel inside the cabin, alowing it to be powered by the same auxiliary system. 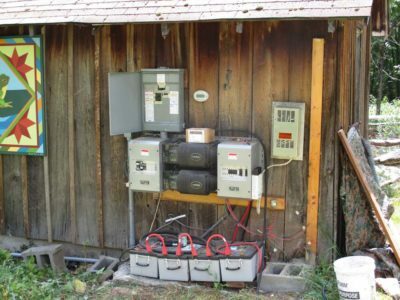 By lunchtime they were finished and I test drove the system in all its iterations available at the time: inverter/battery bank power to the house or barn, gas generator power to the house or barn. I spent a couple days making more proper housings for the system electronics and the generator and this chapter was complete. 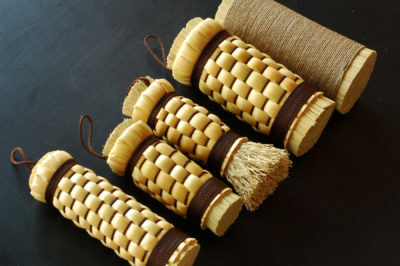 This is a rare blog without pictures as there is literally nothing to show. It’s almost like Claude Rains telling you to move along because there is nothing to see. But it is not without exciting information (to me, at least). The return of the hydro turbine core last week was a time of great celebration. 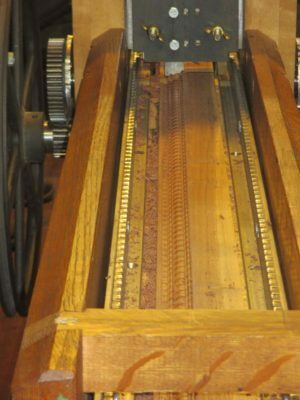 I am delighted that I decided to return that unit to the manufacturer for the replacement of the rotor bearings; I did not want to be learning-on-the-job by trying something I had not really done before – replacing the bearings on an expensive, high-stress high-precision delicately balanced machine. I know that come a zombie apocalypse I will have to do it myself or find someone locally who can, so I purchase two extra pairs of the sealed bearings necessary for the task. Given existing performance projections that gives me another 25-30 years of functionality to the unit. Reassembling the turbine unit took almost no time, 10-15 minutes or so. Reinstalling it into the system took about the same amount of time. Tracking down the location of the breached water line from unrelated storm damage that had occurred since I dismantled the turbine took the longest. 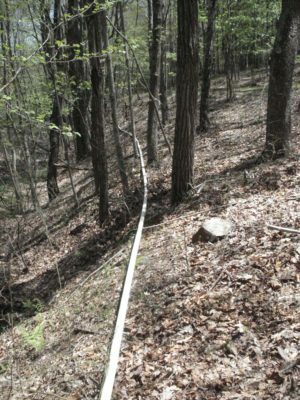 A tree branch had fallen and cracked the penstock (the 2″ PVC pipe from the water capture to the turbine) disrupting the water flow to the turbine, and once the damage was found the repair took only a few minutes. I keep a good inventory of repair parts on hand since my water line is above ground, snaking through the forest for almost 1200 feet. 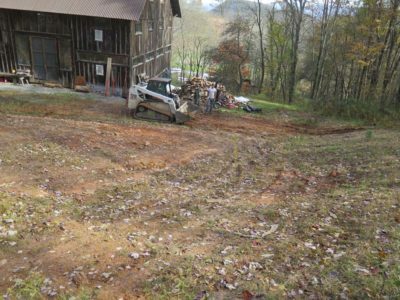 I would love to have the water line buried but with our climate, topography and geology it would require digging a three-foot-deep trench a quarter mile in rocky sub-soil. Until I inherit a new family tree with gobs of money I will make do with the status quo. Once the system was all together and running I knew instantly that something was dramatically different. For starters, the turbine unit was so quiet I turned it over just to make sure it was running! For the previous nine years ever since the system was installed, when the turbine was operating under full load it produced a whine that was distracting for quite a long distance. Since it was that way from Day One I had no idea it was not supposed to be so. But now? Eerily quiet, just barely audible even at the stillness of dusk. Although I know what to listen for I still have to strain a bit from the front porch to hear it working. A second observation was that the output of the unit had increased a fair bit. 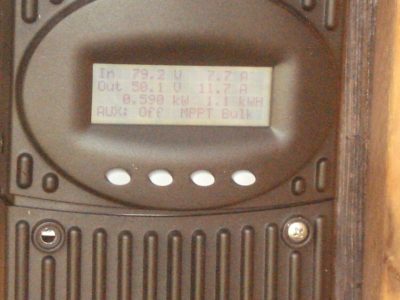 I have not yet installed the new digital metering unit for that part of the system, but I can tell the difference in the integral monitor which is nothing more than a blinking light indicating the input current to the charge controller. All I can say is that it was blinking about twice as fast as I had come to expect for that particular water flow. I wrote back to the fellow who replaced the bearings with these observations, and asked him if he noticed anything during his work (he succeeded the previous owner of the company since I purchased my unit a decade ago). He confirmed that he noticed one of the bearings was not seated properly and he took special care in aligning everything correctly. It appears that the misalignment caused both a whine in the turbine in operation and also some substantial drag on the turbine rotor shaft. Hence the “new” turbine is both quieter and more efficient in operation. Who knows? Maybe the properly aligned bearings will last 20 years instead of 8-10. Needless to say I am thrilled with this outcome, and await the developments in the solar panel controller malfunction situation. Among the few public observers to whom I pay attention, Nassim Nicholas Taleb has a place at the table if for no other reason than his monumentally insightful book The Black Swan: The Impact of the Highly Improbable. Now, change gears to the old insight from the military logistics and supply realm, “Two is one, and one is none,” an exhortation on the value of redundancy for important operating systems and supplies. Well, that particular old black swan bit me in the nether regions recently as I found that I’d better start with a bigger number for electricity supply. 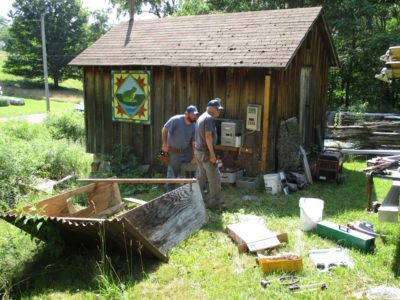 Since becoming my own Power Company for The Barn there have always been hiccups; a connection or section of water line breaks, storm debris clogs the hydro system intake or turbine nozzle, even a nearby lightning ground blowing the fuses on the solar array. In these cases the interruption of one or the other power source is not an activity-stopping hurdle, although it can be a bit of a nuisance and interruption to address. 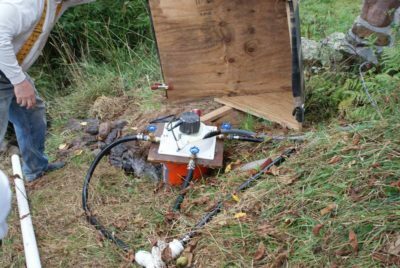 In essence my system is a hybrid of the microhydrolectric turbine generating power 24/7 through much of the year, along with the array of six 235-watt solar panels cranking out juice whenever it is daylight and they are not buried under snow. 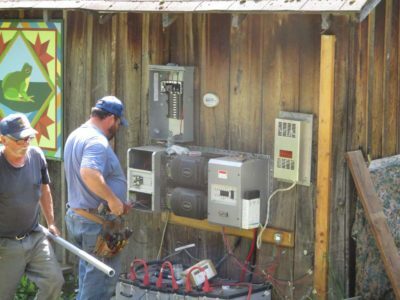 When you are your own public utility, maintenance is never far from the “To Do” list. 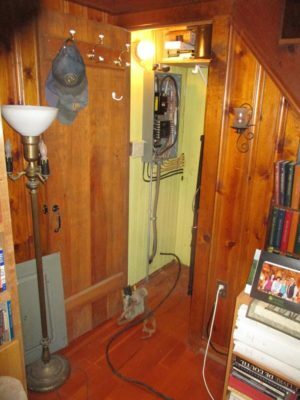 My two electron sources are tied together in a complex control system designed and installed by Rich at Nooutage.com and my friend BillR, a retired electrical engineer with a robotics specialty. For the past half dozen years or so it has been humming along, providing all of what I need in the barn for general usage. 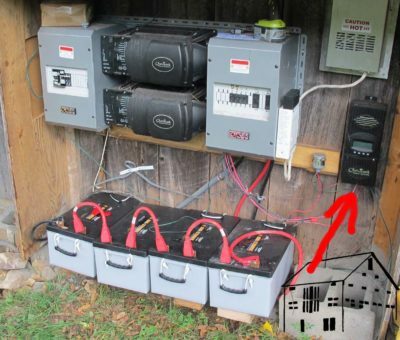 Even in the dead of winter, when I have the hydro system mothballed during the coldest weather, the solar panels keep the batteries charged and I can operate pretty much normally if I am the least bit attentive. 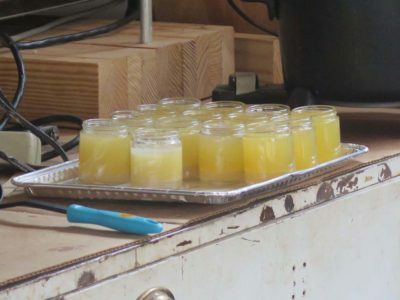 If I know I need to use a lot of electricity with a machine or a heating coil (processing beeswax in cookers, for example) I know I need to wait for a nice sunny day. When I have a particular need for ultra high wattage consumption, like my smelting furnace of kiln, I have to fire up the smaller (3500w) of my two Coleman Suburu generators for that isolated need. Flash forward to three weeks ago as we were spending a day in the studio recording another session for the Gragg Chair video. I had checked the system the night before as I do routinely, and it was working fine. 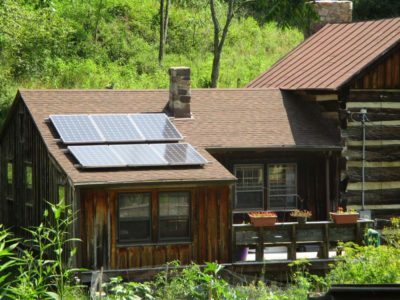 Batteries were topped off, solar panels pounding out watts, hydro puttering along. 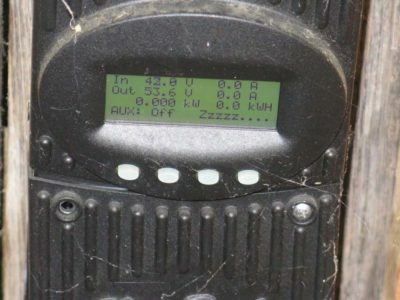 (On a normal day each of the production components produce somewhere in the neighborhood of 5kwH, higher on a sunny summer day). Just as I was coming to the end of a session of steam bending some chair parts the room went dark. Quickly I hustled down the hill — I do not run any longer since breaking my hip three years ago — and saw that the system had shut itself down for no apparent reason. It booted back up manually, but still the work for the recording session was lost. I was leaving town the next morning for a week so I put off conducting the investigation of the hiccup until I got back. On returning I was able to confirm that the solar panels were contributing zero to the system performance. It. Jjust. Went. To. Sleep. The hydro turbine was still working as it should so the overall system function was adequate, but several days of chasing down the solar inactivity proved fruitless, despite numerous emails and phone calls with BillR, who assigned me several detailed troubleshooting tasks, and literally hours on hold with the tekkies at the solar control module manufacturer. In the end the tekkies told me there was some sort of hardware failure and I needed to disconnect the solar control unit and send it to them for their ministrations. So I did. As all of this was unfolding, the hydro turbine suddenly (literally overnight) developed the growling rumble of worn out bearings. I took it off-line as soon as I noticed this, dealing with two $15 bearings is one thing but letting them run to destruction might have damaged the $2k turbine and that was not high on my list of risks to take. After speaking to the turbine manufacturer I decided to remove the turbine core and ship it back to him for new bearings. Replacing the bearings myself was not really an option as I do not possess some of the specialized tools required for the job, although I will have to address that shortcoming in the future. 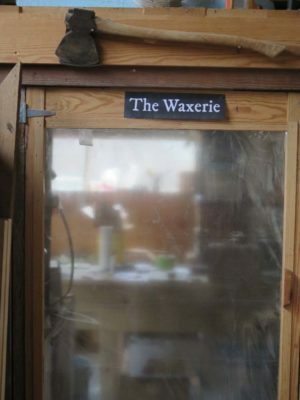 Quick as a bunny I was without any power system input to the barn and things ground to a halt, including cancelling/rescheduling the Boullework Marquetry workshop that was slated for this weekend. 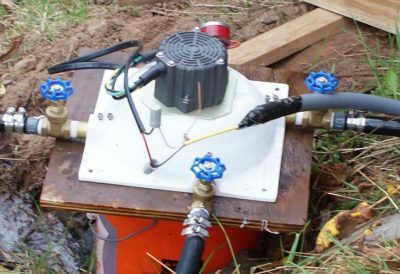 For now all I can do is wait on the turbine manufacturer to return the turbine core with then new bearings and hear back from the solar control module manufacturer for a report on that unit, and contact the local electrician to come and wire in my gas generator to the system. In a true Black Swan event both my redundant power sources failed at the same time. Maybe I should have called Nassim Taleb first.